Have you been playing Rainbow Six Siege daily and realised that you haven’t been able to improve your play, aim or just advance in ranks? Rainbow Six Siege is a tactical first-person shooter which requires a lot of knowledge, game sense and precision. Fortunately for you all those things can be improve with the right coaching. 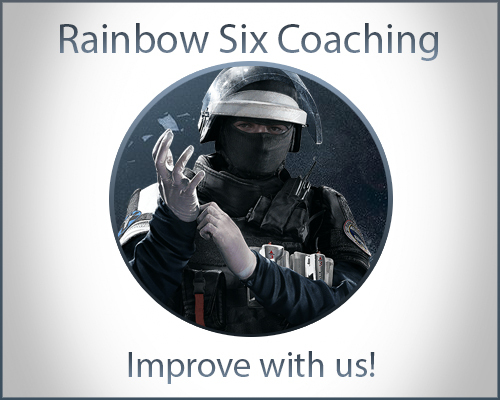 We have an outstanding coaching team made full of veteran Rainbow Six Siege players with great skill and knowledge. Buying coaching can greatly improve your gameplay and game sense, but it all depends on you after all. Buying coaching with Proboosting is very simple, you just need to select the number of hours you would like to be coached. You can also choose a specific coach for your needs. Do I have to be ranked for coaching? No, you don’t you can be coached either way. How many hours of coaching would you recommend? It all comes down to you, if you are a fast learner you won’t need as many hours as others. How can I communicate with my coach? Will this help me to get higher ranks? If you actively listen and understand what the coach is teaching you and then apply the tips while you are in game, yes it will. Will your boosters talk to my Steam or uPlay friends? No, we will be playing in offline mode. No one will be aware that you are online. Every order is usually started within an hour. You can also choose your coaching hours as well as divide them into as many parts as you want. Knowledge, tips and the ability to study the game more closely and improve yourself with the help of our coaches. Great coach. Addressed some mistakes I was making and immediately addressed some settings problems I had within the 1st few minutes. Can definitely say I noted an improvement in my game play. Went from gold 4/3 to gold 1 after the coaching. He will absolutely go the extra mile and takes pride in your accomplishments. A fantastic coach to say the least. he helped me re-introduce me into the game, really enjoyed my time playing with him. Very nice coach good player he will explain map and how to improve game scene and aim. A dynamic spin on the classic shooter-type game that Call of Duty and Counter-Strike have come to make us love over the years, Rainbow Six Siege is taking the video game market by storm. This refreshing take on a well-loved style of gaming was released only two years ago, but its success has definitely classified it as a strong contender in a market full of games just like it – games with guns and goals and gold. After only such a short time, Rainbow Six Siege has already garnered and captured the attention of millions and millions of players all over the world. Once you look at it through a closer lens, it’s easy to understand why. Most gamers love a typical shooter game – this is how games like Counter-Strike and Call of Duty have stayed afloat for years on end. So when a new game comes in, takes this well-known form of gameplay and adds elements that make it seem like an entirely new thing, it is sure to be a hit. With this in mind, it is incredibly easy to understand why players all over the globe are so focused and dedicated to this game, with most of them even going the extra mile and obtaining a Rainbow Six Siege coach. Why Play Rainbow Six Siege? After knowing about Rainbow Six Siege and realizing that there are hundreds upon hundreds of other shooter games out there similar to it, you might be asking this question. However, this is incredibly easy to answer. Rainbow Six Siege, at its core, is a game focused on two teams composed of five members each, who compete against each other in an attack-and-defense type of setting. The teams are dressed as special and well-equipped military forces, running across a complex map with special guns and unique weapons in an effort to best each other and outgun the opposing team.What sets this game apart, however, is the genius in its design and setting. The great care that developers of Rainbow Six Siege put into incorporating subtle nuances and amazing themes within this video game has certainly paid off. The gameplay gives off a very unique cat-and-mouse vibe between the two teams as they try to obtain information from one another. Not only does it keep players on edge, but it also keeps them invested and dedicated – so much so that Rainbow Six Siege coaching has become practically necessary for nearly all players of the game. Rainbox Six Siege offers a very interactive kind of gaming experience for its players. Teams can work together and communicate inside the game in order to discuss strategies and plans of action that will lead their team to victory. It is not a game that one must or can play alone. Rainbow Six Siege boasts of a wide network of players, with millions of dedicated gamers all over the world engaged in the game. With all of this in mind, it is easy to see why people are so dedicated to winning the game and helping their teammates and why thousands of players find it even necessary to get a Rainbow Six Siege coach for themselves. Why Try Rainbow Six Siege Coaching? By nature, Rainbow Six Siege is an incredibly captivating game. It keeps you on the edge of your seat, clutching your controller tight in anxious anticipation of the outcome of the game. In addition to this, it is naturally an incredibly competitive game. At its core, Rainbow Six Siege is a versus-battle game with two opposing teams composed of five members each trying their best to outrun and outgun each other. This makes it obvious why almost all players of the game see Rainbow Six Siege coaching as a necessity. Not only does a coach help you improve the way you play, teach you how to make your aim better and more accurate, and assist you in advancing through the in-game ranks, a coach also teaches you brand-new knowledge about the game and even various tips and tricks that will help you win. Rainbow Six Siege coaching helps you become better at the game not only for yourself but also for your teammates. Whether you are just a casual gamer wanting to get better for your friends and for your own enjoyment or a professional gamer aiming to become competitive in this particular video game, a coach is sure to help you reach all the goals you set for yourself. After all, playing Rainbow Six Siege is a skill, and like all skills, it can be learned. With proper guidance, you can become better. Here at ProBoosting, we understand your unique needs and wants as a player. We prioritize helping you improve your gameplay and helping you know more about the game as a whole. Although we do believe that improving in gameplay lies on the player himself, we also understand that some players need a little push and a bit of proper guidance to become great. ProBoosting understands that all gamers have a unique set of skills and different needs that must be addressed in order to help them become better at Rainbow Six Siege. Our coaches are focused entirely on addressing your specific concerns as an individual as quickly and as accurately as possible. Coaches from ProBoosting are dedicated to helping you improve the way you play, your skills in tactics and planning, and even your aim. We understand how frustrating it is to practice and practice and practice and still fail at advancing through the ranks and becoming more competitive within the game – and we know how to fix it. Getting ProBoosting’s R6S coaching services is incredibly simple and easy. All you need to do is select how many hours you would like your session with one of our coaches to last. You are even free to choose a specific coach to address your specific needs. In addition, we not only understand your needs as a gamer, but we also understand your concerns as a consumer. You can rest assured that ProBoosting guarantees safety and security in all of your transactions so that we can help you become the best gamer that you can be as fast as possible.